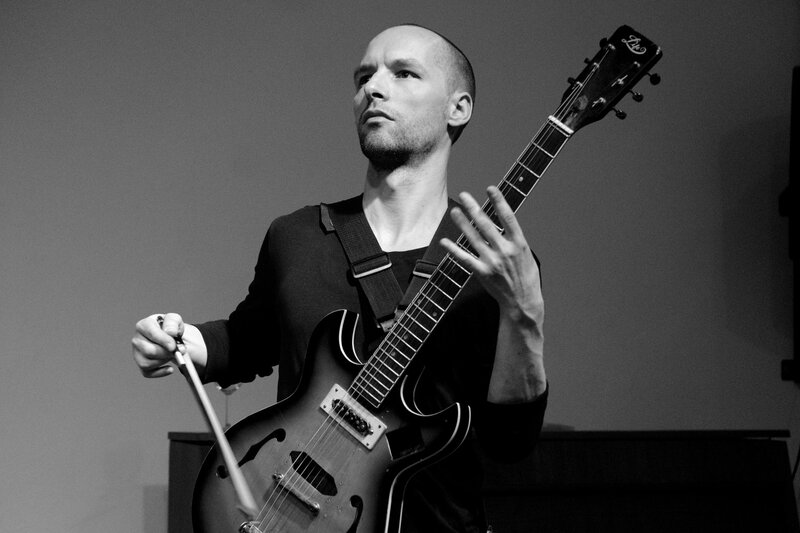 Hannes Buder (born 1978 in the former GDR) is a musician, improviser and composer in the field of experimental music. His works concentrate on issues of movement, authenticity, intuition, minimalism, density and slowness. Buder’s current projects include the bands ‘Zug Zug’ with Todd Capp and Andrew Lafkas, ‘Gravity’ with Hannes Lingens and Andrew Lafkas, the duo with Luc Houtkamp, the dance company “one:third”, and his solo project. Beyond that he has collaborated with Audrey Chen, Tony Buck, Audrey Lauro, Hilary Jeffery, Mike Majkowski, Matthias Bauer, Steve Heather, the Berlin Improvisers Orchestra and many others. Hannes Buder’s Solo recordings include “changes” (2000), “dunkelbunt” (2004), “openyoureyescloseyoureyes” (2006) and “changes II” (2015). He performed concerts in Europe, Australia and in the USA. Buder has also composed, improvised and recorded music for different dance (Oxana Chi, Judith Sanchez Ruìz), theater (Jörg Mihan, Johannes Maria Schmit) and film projects (Barbara Lubich, Annick Gaudreault). He’s been giving workshops at festivals, music schools and with prisoners in jail. He studied guitar at the Carl Maria von Weber Conservatory in Dresden and the Franz Liszt Conservatory in Weimar.